We discuss primarily the ship as a system, and as a link in the transportation system. Introduce the participant to the complexities in the marine environment and the mechanisms involved in the ship system. The participant is also introduced to the various terms used in naval architecture. 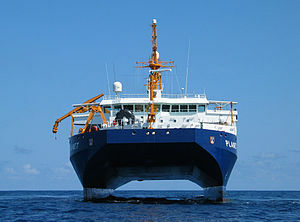 Research ship Planet of the German Navy, a SWATH design which evolved from the catamaran concept. To introduce the terms commonly used in naval architecture and introduce the ship as a system. This page was last edited on 16 April 2019, at 02:21.